(Nanowerk News) An international team of physicists has used a scanning tunneling microscope to create a minute transistor consisting of a single molecule and a small number of atoms. The observed transistor action is markedly different from the conventionally expected behavior and could be important for future device technologies as well as for fundamental studies of electron transport in molecular nanostructures. The physicists represent the Paul-Drude-Institut für Festkörperelektronik (PDI) and the Freie Universität Berlin (FUB), Germany, the NTT Basic Research Laboratories (NTT-BRL), Japan, and the U.S. Naval Research Laboratory (NRL). Their complete findings are published in the 13 July 2015 issue of the journal Nature Physics ("Gating a single-molecule transistor with individual atoms"). Transistors have a channel region between two external contacts and an electrical gate electrode to modulate the current flow through the channel. In atomic-scale transistors, this current is extremely sensitive to single electrons hopping via discrete energy levels. In earlier studies, researchers have examined single-electron transport in molecular transistors using top-down approaches, such as lithography and break junctions. But atomically precise control of the gate—which is crucial to transistor action at the smallest size scales—is not possible with these approaches. 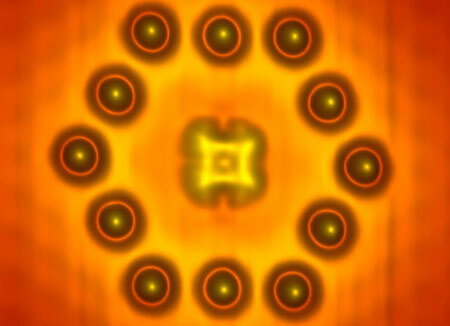 The team used a highly stable scanning tunneling microscope (STM) to create a transistor consisting of a single organic molecule and positively charged metal atoms, positioning them with the STM tip on the surface of an indium arsenide (InAs) crystal. Dr. Kiyoshi Kanisawa, a physicist at NTT-BRL, used the growth technique of molecular beam epitaxy to prepare this surface. Subsequently, the STM approach allowed the researchers to assemble electrical gates from the +1 charged atoms with atomic precision and then to place the molecule at various desired positions close to the gates. Dr. Stefan Fölsch, a physicist at the PDI who led the team, explained that "the molecule is only weakly bound to the InAs template. So, when we bring the STM tip very close to the molecule and apply a bias voltage to the tip-sample junction, single electrons can tunnel between template and tip by hopping via nearly unperturbed molecular orbitals, similar to the working principle of a quantum dot gated by an external electrode. In our case, the charged atoms nearby provide the electrostatic gate potential that regulates the electron flow and the charge state of the molecule." But there is a substantial difference between a conventional semiconductor quantum dot—comprising typically hundreds or thousands of atoms—and the present case of a surface-bound molecule. Dr. Steven Erwin, a physicist in the Center for Computational Materials Science at NRL and expert in density-functional theory, pointed out that, "the molecule adopts different rotational orientations, depending on its charge state. We predicted this based on first-principles calculations and confirmed it by imaging the molecule with the STM." This coupling between charge and orientation has a dramatic effect on the electron flow across the molecule, manifested by a large conductance gap at low bias voltages. Dr. Piet Brouwer, a physicist at FUB and expert in quantum transport theory, said, "This intriguing behavior goes beyond the established picture of charge transport through a gated quantum dot. Instead, we developed a generic model that accounts for the coupled electronic and orientational dynamics of the molecule." This simple and physically transparent model entirely reproduces the experimentally observed single-molecule transistor characteristics. The perfection and reproducibility offered by these STM-generated transistors will enable researchers to explore elementary processes involving current flow through single molecules at a fundamental level. Understanding and controlling these processes—and the new kinds of behavior to which they can lead—will be important for integrating molecule-based devices with existing semiconductor technologies.